The words below are from Reprint No. 4468 of the Original Watchtower and Herald of Christ’s Presence. The Apostle does not tell us the basis of his confidence in doing the will of the Lord in going to Jerusalem, but we may be sure that he had substantial reasons for believing that he was walking in the Lord’s way. His entire character shows us that he would be too cautious, as well as too faithful, to go in any direction contrary to the Divine will. 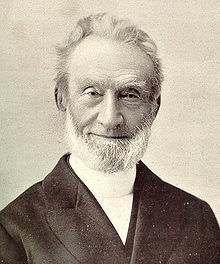 “George Mueller (1805-1898) was a Christian evangelist and the director of the Ashley Down orphanage in Bristol, England. “He cared for 10,024 orphans during his lifetime, and provided educational opportunities for the orphans to the point that he was even accused by some of raising the poor above their natural station in British life. He established 117 schools which offered Christian education to more than 120,000 children. “On 7 October 1830, he married Mary Groves, the sister of Anthony Norris Groves. At the end of October, he renounced his regular salary, believing that the practice could lead to church members giving out of duty, not desire. He also eliminated the renting of church pews, arguing that it gave unfair prestige to the wealthy (based primarily on James 2:1–9). “In 1834, he founded the Scriptural Knowledge Institution for Home and Abroad, with the goal of aiding Christian schools and missionaries; distributing the Bible and Christian tracts; and providing Day-schools, Sunday-schools and Adult-schools, all upon a Scriptural foundation. Not receiving government support and only accepting unsolicited gifts, this organisation received and disbursed £1,381,171 – around £113 million in today’s terms – by the time of Müller’s death, primarily using the money for supporting the orphanages and distributing about 285,407 Bibles, 1,459,506 New Testaments, and 244,351 other religious texts, which were translated into twenty other languages” (Wikipedia). In 1836 Mueller and his wife prepared their own rented home at 6 Wilson Street, Bristol for the accommodation of 30 girls and not long after, they furnished more houses in Wilson Street to care for up to 130 children. By 1870, 1,722 children were being accommodated in 5 homes (Wikipedia). A brother in the Lord came to me this morning and, after a few minutes of conversation gave me two thousand pounds for furnishing the new Orphan House … Now I am able to meet all of the expenses. In all probability I will even have several hundred pounds more than I need. The Lord not only gives as much as is absolutely necessary for his work, but he gives abundantly. This blessing filled me with inexplicable delight. He had given me the full answer to my thousands of prayers during the [past] 1,195 days” (Wikipedia). Is It Finally Time To Change 12/29/2013 — Executing true and lasting change in your Christian life. Hezekiah’s Song of Trust by Carl Hagensick, and Pray Without Ceasing by Peter the Damascene. The Beauties of the Truth. Importunate Prayer. BIBLE Students DAILY. 1 Thessalonians 5:16-18: Prayer—The “Oxygen” for the New Creature in Christ. BIBLE Students DAILY. Posted on August 25, 2018 August 28, 2018 by Bible Students DailyPosted in Inspiring Gems of Truth & BlogTagged acknowledge GOD, ask God, change your life, Christian questions, deciding, deciding to change, decision, executing true and lasting change, George Mueller, George Muller, God's will, God's wisdom, how to change, how to change your thinking, https://biblestudentsdaily.com/2018/08/25/how-to-decide-the-lords-will/, James 1:5, negative thinking out, no will, overcome, patient endurance, positive thinking in, power of prayer, pray, prayer, Proverbs 16:3, Proverbs 21:5, R4468, repent, Reprint 4468, take thoughts captive, talk to God, the battle of the mind, thinking pure thoughts, time to change, watch, Watchtower, what to do, which way to go, word of God.